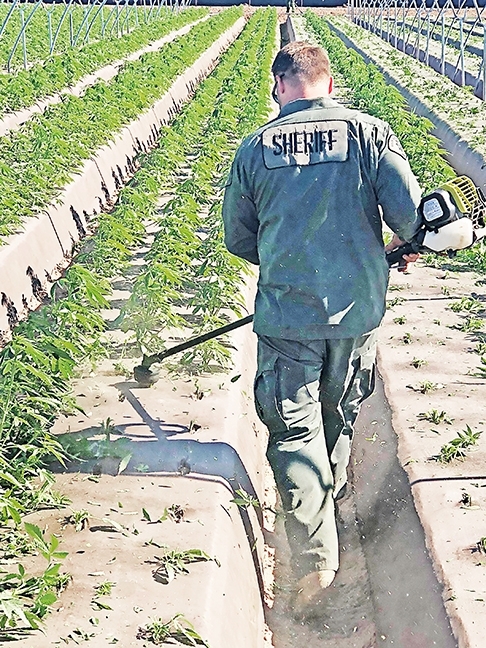 Row after row of pot plants were weed-whacked into oblivion in late October as county sheriff's deputies served an enforcement operation on a massive unlicensed cannabis cultivation in the Santa Maria Valley. 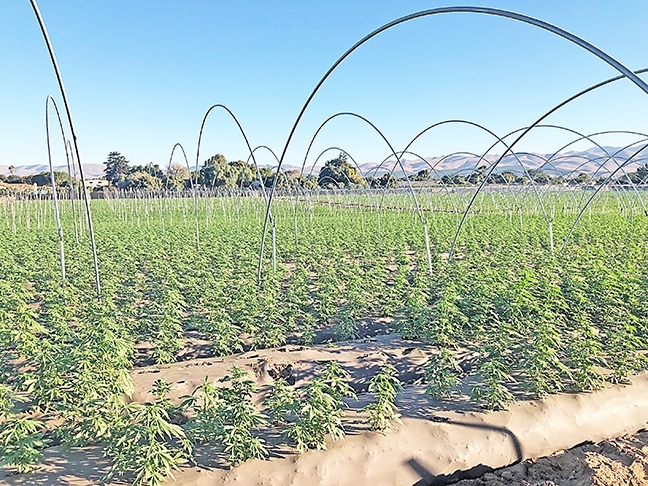 The Santa Barbara County Sheriff's Office received a tip that a large-scale cannabis grow was ongoing among the valley's farm fields east of Highway 101, Lt. Brian Olmstead told the Sun. After an investigation, the Special Investigations Bureau served a search warrant for the site where the Sheriff's Office's Cannabis Compliance team began two days of work on Oct. 29 to destroy the more than 400,000 plants growing there. The illegal grow operation busted by the Sheriff’s Office in Santa Maria used the same agricultural land, techniques, and equipment as the valley’s staple crops like strawberries, Lt. Brian Olmstead told the Sun. The bust sets a record for the number of plants seized in any one operation by the Sheriff's Office, Olmstead said. As a point of comparison, the Sheriff's Office announced in October that it had helped U.S. Forest Service crews locate and eradicate more than 100,000 black market plants in the Los Padres National Forest from January through September of this year, whereas Sheriff's Office crews destroyed more than four times that number of plants in two work-filled days for the Santa Maria bust. The site, located on the 2700 block of Telephone Road, employed the same methods to grow cannabis that were used there previously to cultivate crops typical to the valley, Olmstead explained. 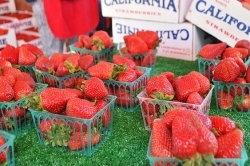 "It was set up like you would grow strawberries, really, the exact same format," Olmstead said. "They had the plowed rows that were lifted, they had plastic where they had done the fumigation and the drip line, and it was planted in the same type of way that you would expect strawberries to be planted." The Sheriff's Office's Cannabis Compliance Team began enforcement operations in September, targeting cultivators who were growing recreational cannabis without the necessary licensing. The first raids by the then newly funded team were in Tepusquet Canyon, destroying more than 1,500 plants across two unlicensed grow operations, Olmstead said. At a Sept. 17 meeting, Santa Barbara County County CEO Dennis Bozanich urged county cannabis cultivators to adhere to the process to attain a county-issued land-use permit, which is required for a state license to cultivate cannabis, before beginning operations. At the time of the meeting, only 40 percent of cultivators in the county had the temporary state-issued licenses necessary to apply for the county's land-use permits. "This is a pathway to keep you in compliance so we don't have to do enforcement," Bozanich said. Since the meeting, the Sheriff's Office has kept up its side of that promise, raiding unlicensed grow operations across the county, mostly in rural areas like Tepusquet, Cebada Canyon near Lompoc, and in the Cuyama Valley. Before the record-setting bust in Santa Maria, the most plants destroyed at any one unlicensed recreational grow was a Sept. 28 enforcement operation that saw nearly 8,000 plants eradicated. Unlike the grows tucked away in rural canyons, the Santa Maria operation was an industrial-scale agricultural endeavour surrounded by crops typically grown in the area, essentially hiding "in plain site," Olmstead explained. "A lot of these locations, ag fields ... are starting to put that black cloth fencing around and they're under hoop houses," Olmstead said. "I don't know how much people pay attention to that since they're so used to agricultural areas." The eradication in Santa Maria was a days-long effort for multiple crews, Olmstead explained, but the raid was preceded by hours of investigation as well. After the Sheriff's Office received the tip about the site, the agency had to find out where the cultivator was with their permitting, how long they'd been growing cannabis there, and if they were truthful when they approached the county for a conditional use permit after Proposition 64 passed in 2016. Cultivators that operated medicinal grows before Jan. 19 of 2016 were allowed to continue cultivation, Olmstead explained, but were required to sign an affidavit with the county saying they had operated under compassionate use. The Santa Barbara County Sheriff’s Office’s Cannabis Compliance Team destroyed more than 400,000 unlicensed cannabis plants at a Santa Maria farm field in late October, the largest single cannabis enforcement operation in county history. Several growers eager to get a jump-start on California's new cash crop weren't truthful when they signed those affidavits, Olmstead said. "What a couple of these grows that we have [raided] have done over the last two months is they signed their affidavit saying there were in existence before that date, which these guys weren't," he said. "Additionally, what these guys were doing was, they actually planted in September, but they didn't even try to get their state license until in October ... so they filed the affidavit falsely." The Sheriff's Office has multiple means of investigating whether cannabis farmers have operated above board and in good faith, Olmstead said, including comparing aerial photograph records collected from satellite imagery and the agency's helicopter unit to verify whether properties were in fact cultivating cannabis grows before January of 2016. Olmstead said that the Sheriff's Office Cannabis Compliance Team is learning more with each investigation, from the manual labor needed to destroy hundreds of thousands of plants to navigating the sometimes several limited liability corporations illegal cultivators set up to obfuscate their operations. "There's so much going on with this," he said. "We know that there's a lot of illegal grows, and we're just starting to hit 'em as fast as we can." The Cannabis Compliance Team is waiting for some additional officers as well, Olmstead said, including three detectives who will focus exclusively on cultivators who are flouting regulations. And with huge, industrial operations like the bust in Santa Maria, the amount of Sheriff's Office time spent working with farming tools and washing the weed smell out of county uniforms has increased exponentially, Olmstead explained. "And that's just one of them," he added. "If more people start doing it this way, there's going to be that many more grows, more plant counts, and it's really all over the county right now, and a lot of them are illegal growers." Managing Editor Joe Payne can be reached at jpayne@santamariasun.com.